In this tutorial, we will be looking at how to use IFERROR and VLOOKUP functions together to trap and handle different errors. In addition, you are going to learn how to do sequential vlookups in Excel by nesting multiple IFERROR functions one onto another. Excel VLOOKUP and IFERROR - these two functions may be pretty hard to understand separately, let alone when they are combined. In this article, you will find a few easy-to-follow examples that address common uses and clearly illustrate the formulas' logic. If you don't have much experience with IFERROR and VLOOKUP functions, it may be a good idea to revise their basics first by following the above links. Depending on your business needs, you may want to disguise the error with your own text, zero, or a blank cell. The result looks much more understandable and far less intimidating, isn't it? As you can see, it returns nothing when the lookup value is not in the search list. Word of caution! Excel IFERROR function catches all kinds of errors, not only #N/A. Is it good or bad? All depends on your goal. If you want to mask all possible errors, IFERROR Vlookup is the way to go. But it may be an unwise technique in many situations. For example, if you've created a named range for your table data, and misspelled that name in your Vlookup formula, IFERROR will catch a #NAME? error and replace it with "Not found" or any other text you supply. As the result, you may never know your formula is delivering wrong results unless you spot the typo yourself. In such a case, a more reasonable approach would be trapping only #N/A errors. For this, use IFNA Vlookup formula in Excel 2016 and Excel 2013, IF ISNA VLOOKUP in all Excel versions. Imagine the following situation: you look up a specific value in a list and do not find it. What choices do you have? Either get an N/A error or show your own message. Actually, there is a third option - if your primary vlookup stumbles, then search for something else that is definitely there! And it will work nicely as long as your users enter a valid number in D2. But what if a user inputs some number that does not exist? In this case, let them call the central office! For this, you embed the above formula in the value argument of IFERROR, and put another Vlookup in the value_if_error argument. But what is the reason to look up "central office", you may ask me. Why not supply the extension number directly in IFERROR? Because the extension may change at some point in the future. If this happens, you will have to update your data just once in the source table, without worrying about updating each of your Vlookup formulas. If the first Vlookup does not find anything, the first IFERROR traps an error and runs another Vlookup. 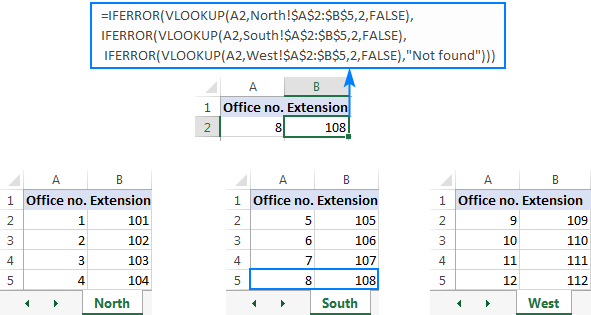 If the second Vlookup fails, the second IFERROR catches an error and runs the third Vlookup, and so on. If all vlookups stumble, the last IFERROR returns your message. This nested IFERROR formula is especially useful when you have to search through multiple sheets as shown in the below example. Let's say, you have three lists of homogeneous data in three different worksheets (office numbers in this example), and you want to get an extension for a certain number. This is how you use IFERROR with VLOOKUP in Excel. To have a closer look at the formulas discussed in this tutorial, please feel free to download our sample Excel Iferror Vlookup workbook. I thank you for reading and hope to see you on our blog next week! 5 Responses to "Excel IFERROR with VLOOKUP - elegant way to trap errors"
Is there a way i can get a cell to return a blank cell after a particular date? if its before a date then use zero. Im having trouble with so many commands. Your timing is excellent. Just started new job and they gave me 3 files with 1 million rows each. Of couse split amongst tabs. I was going crazy with all the vlookup and now you helped me save hours of work. Thank you thank you. If column a contains a 1 or 2 look at the same row in column C and if that contains ANY entry (will most likely be a date) count it.